Great Barrier Reef Politics - Integration Through Media ....! The Great Barrier Reef has not been exempt from the political tussles of a troubled environmental conscience. Its monumental size, and its status as an ecological wonder meant little in the late 1960s, when the appetite for development mattered most. In 1967, it seemed to be facing imminent destruction, another casualty of a predatory mining industry keen for new conquests. The state of Queensland had elected a National Party government hungry to exploit the environment’s wares. As local tour operator Alistair Pike explained to the ABC, “We had a fairly full-on development oriented government… and mate, if they couldn’t drill it, mine it, chop it down or whatever, they really didn’t want to know about it.” It took characters such as that feted “rat bag” of an activist, rogue of action and Mission Beach artist John Büsst to bring angered but focused attention on threats to bulldoze Ellison Reef. An impeccably connected person, he had the ear of Australian prime minister and fellow diver Harold Holt. A cast of characters were duly mobilised: the CSIRO forester Len Webb, and president of the Queensland Wildlife Society Judith Wright became enthusiastic and un-phased recruits. In the Australian environmental conscience, this gorgeously freakish wonder of ecology has been seen in isolation, its problems a local provenance and interest rather than a global phenomenon of ailing. 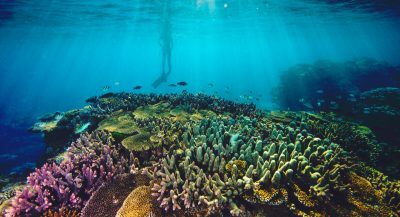 As the earth continues is warming push, earthbound, and very terrestrially unimaginative politicians have been attempting to treat the Reef’s woes as separately resolvable from the broader challenges of climate change. Little wonder, then, that a problem viewed in such limited terms could be duly remedied by donations without tender, lump sum payments without review. Narrowly viewed problems tend to lead to narrowly devised solutions. Such was the nature of the Turnbull government’s $444 million “rescue package” to the Great Barrier Reef Foundation, one conceived and delivered in a haze. The issue of who takes the reins and ensures study and conservation was never going to be free of a political push. While common sense suggests that the task be left to government organisations within the scientific community – CSIRO, the Australian Institute for Marine Science and the Marine Park Authority, other contenders have been stalking the scene. The Great Barrier Reef Foundation was deemed the chosen one, but questions are circulating as to why that outfit got preferment for such largesse. For one thing, it seemed an oddly hasty move, given that it entailed an expenditure of almost the entire spending allocation for the 2050 Reef Partnership program. Then came the organisation’s profile. Its chief executive Anna Marsden is married to Ben Myers, chief of staff to former Queensland premier Campbell Newman. (Newman can be counted, incidentally, as one of those durable environmental sceptics who prefers the bulldozer to reef hugging conservation.) One of the four founding businessmen behind the venture is the current chairman of the foundation, and former chairman of Esso Australia and the Commonwealth Bank. Advocates of barrier reef protection, beware. That particular non-profit group had a revenue stream of less than $8 million in 2017, a humble outfit with six full time employees. Nothing suggests that those working for it had a clue that this staggering cash supply was coming their way. “We didn’t have much time before the announcement to be prepared for it,” came the perplexed, albeit thrilled Marsden. Easy to understand why Marsden considered this winning the lottery. Overnight, even given a spread of funding over six years, the Foundation has become one of the largest, if not largest NGO in Australia. By way of grim contrast, government employees connected with the science fraternity are facing skint measures to fund their projects. The bungling has led to Josh Frydenberg, the environment and energy minister, asking the secretary of his department to urge the National Audit Office to give the funding arrangement serious consideration “as a priority”. This piqued the interest of Tony Burke, Labor’s opposition spokesman, who claimed that it “was an extraordinary step for the secretary of the department to be sending a letter like that to the Auditor-General at the exact same time that Josh Frydenberg is standing up in Parliament saying there is no problem here”. The outstanding feature of the funding spill to the foundation is its conspicuous absence of any reference to climate change. It is a hermetic form of deliverable rescue sans climate science, an approach that politically factors in the climate change sceptics within the Turnbull government. By all means try to preserve an Australian wonder; but ditch the climate science. The conclusion of one unnamed scientist to the Fairfax press about the nature of this arrangement was elementary and crude: “Obviously this is political – it’s to head off Labor making a big issue of the Great Barrier Reef at the next election.” Woe to the reef.